When you take two classic things and mash them together like Star Wars and some of the Looney Tunes characters you know you will end up with something fun. 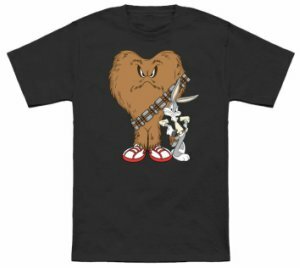 On the front of this t-shirt you will see a colorful large image of the big hairy Gossimer and Bugs Bunny, Gossimer is brown and furry with the shoulder belt on looking just like Chewbacca and Bugs Bunny is outfitted with a vest, belt and white shirt looking just like the Star Wars character Han Solo. The shirt is available in a wide variety of sizes that range from Small to 6XL and you get to choose from 12 different fun and vibrant colors.